Manchester United have qualified for the final of the 2017/18 English FA Cup after coming back from a goal down to beat Tottenham 2-1 in the semi final on Saturday evening, April 21. Tottenham went into this match with lots of confidence considering the fact that the match was played at the Wembley Stadium which is their adopted home ground. They took the lead in the 11th minute through Dele Alli who was assisted by Christian Eriksen, but Paul Pogba would have himself to blame for his mistake. 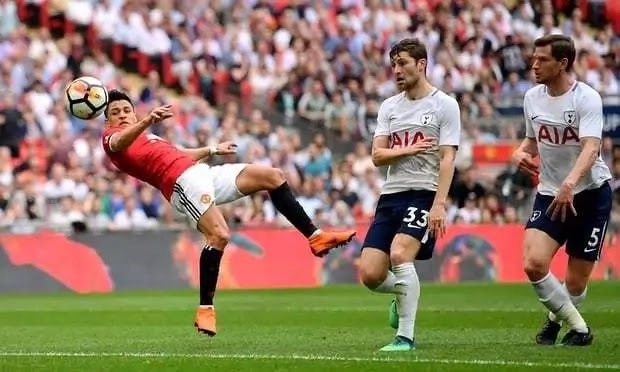 Chilean international striker Alexis Sanchez restored parity for Manchester United in the 24th minute after being superbly set up by Frenchman Paul Pogba. Pogba however redeemed himself for the gaffe that allowed Tottenham to score the opener. The first half ended 1-1 as both sides failed to score more goals. Manchester United came out aggressive in the second half, but they had to wait till the 62nd minute before they scored their winning goal through Ander Herrrera.